What’s the Opposite of Spoiled? I had an interesting talk with one of my children a few weeks ago. He’s 9 years old, in 4th grade, and is just beginning to really ask some big questions about himself and his place in the world. Recently, having noticed his interest in money, how much he has and on what he should spend it, my husband and I decided it was time for him to learn about its value by establishing an allowance. In exchange, we told him, he would be expected to do certain responsibilities every day. We made a list together about what these things would be, and decided what amount he would earn weekly. I thought it was great, my son seemed pleased, and so we forged ahead. Then I started reading some of the articles about Ron Lieber, a speaker we’d scheduled for the February 28th Pause/Play event at the 14th Street Y. He’s the New York Times “Your Money” columnist and author of the book “The Opposite of Spoiled: Raising Kids Who Are Grounded, Generous and Smart About Money”. Given what my son and I had just spoken about and the plan we’d made within my own family, I thought it was pretty good timing. I dove into some of the articles Ron had written, expecting the advice to be somewhere along the lines of what we’d already put in place. But it didn’t happen that way. Ron wisely points out that my husband and I don’t get money for doing chores around our house, and neither should my Son. It makes sense that children should understand that their contribution to the family and to the home is just part of being a responsible human being. These things should not be tied to money. Besides, there will surely come a time when there is something else my son will decide has more value to him than money. What happens the day he decides he’d rather not unload the dishwasher and just pass on his allowance that week? But more importantly, Ron (in greater depth than I will go into here) makes a great case for understanding the full scope of money and what it can teach. He underscores the importance of saving, and the importance of giving. Here’s what happened when I spoke to my son after listening to Ron’s advice. I told him that he was expected to do the list of chores we’d made together, and that his doing them was important to the well-being of our family. I told him that doing them was his responsibility, and if he neglected them he would lose privileges. I explained that the doing of these chores was not in exchange for his allowance. His allowance would be given to him every week, because it was important that he have some money to spend, to save, and to give. We talked about what that meant. As it turned out, he was already thinking hard about spending vs. saving. He had been troubled by the notion of spending money he received because he knew it meant he wouldn’t have it anymore. The notion of a ‘savings jar’ was guidance that was a relief to him. Probably though, the most gratifying thing I got out of this conversation and this approach was the conversation about giving. I hadn’t realized that my son had noticed and was bothered by the fact that some people had more than others. He began talking immediately about homeless people that he sees every day in the subway, and organizations that help children and animals. In short, he didn’t fully realize the difference he could make and the contribution he could be in the world by his giving. To say it was heartwarming is an understatement. There is so much more great advice in this book, If you didn’t get a chance to come to the lecture on Saturday, we recommend that you check this link for other venues where you can see Ron. You can also purchase his book by visiting here. 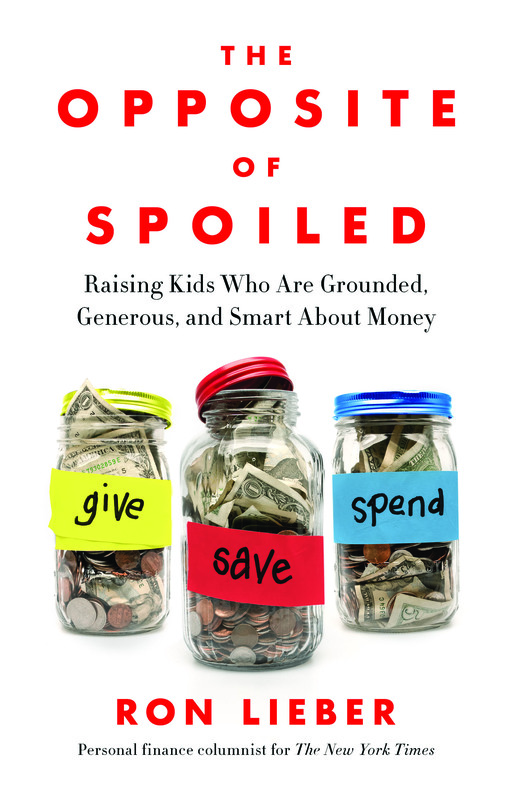 Finally, here are a few links where you can read more about Ron’s advice on giving (for grown-ups), giving (for parents and kids to discuss together), and on kids and gratitude.